It’s finally Saturday. Our busy week is finally over. On to the busy weekend! Today we had a Girl Scout outing. The whole troop went to Oleta State Park for a day of fun. 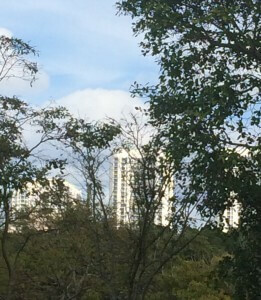 Oleta is this great park that is just a few miles from us, in between two of the busiest streets in Miami. But it is huge and surrounded by water, so if you don’t look up, you’d never remember where you are. 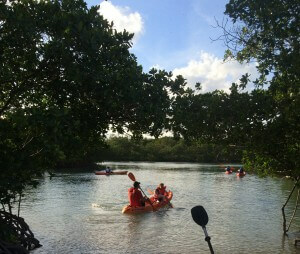 During our outing we did a nature walk, kayaking and of course a cookout with hot dogs and s’mores. As the troop leader I went last night to pick up the supplies. I had to forego my beloved Presidente in favor of Winn Dixie, because 1) I also needed paper products from the dollar store in the same parking lot, 2) the hot dogs at Presidente scare me, and 3) s’mores with Hershey’s chocolate is fine for the kids. But I’m a Trophy Wife. I like to use Ghiradelli chocolate squares in my s’mores. The squares that have mint filling. Or caramel. Or raspberry. So that when you bite into your s’mores it oozes all together with the marshmallow and is pure deliciousness. Am I the only one drooling right now? Ghiradelli is not found at Presidente. So Winn Dixie it was. We did our shopping and while I cringed at some of the prices ($5 for a mini watermelon?! ), we proceeded to reach the check out with no problems. The cashier started to ring us up, and my helpful husband began to bag our groceries. Then the cashier was done ringing me up, but my husband was still bagging. So obviously, the cashier took over bagging. Is what should have happened. What actually happened is the cashier just walked away. Leaving my husband to finish bagging our groceries! My husband and I just stared at each other, in total disbelief. And then I stood there while he finished bagging. Hey, if bagging groceries is beneath the cashier then it is definitely beneath an Arizona Level Trophy Wife. When we got home I started organizing the supplies. And started to feel how I always feel before a gathering I’m hosting. Like there isn’t enough food. So I decided to bake something. I found a recipe on Youth Lit Reviews for easy chocolate chip cookies. But I didn’t have the main ingredient – a box of white cake mix. I did have a box of devils food cake mix. Which means the cookies would then be chocolate chocolate chip cookies. And that is all kinds of good. The cookies had a nice, cakey (apparently that is not a word, but I feel it is a great description, so red line be damned, it is staying) texture and the chocolate chips ensured it was just pure chocolate taste. Yum. Perfect after an afternoon of kayaking. Mix all ingredients together, stirring to combine. Drop by rounded tablespoons onto greased baking sheets. 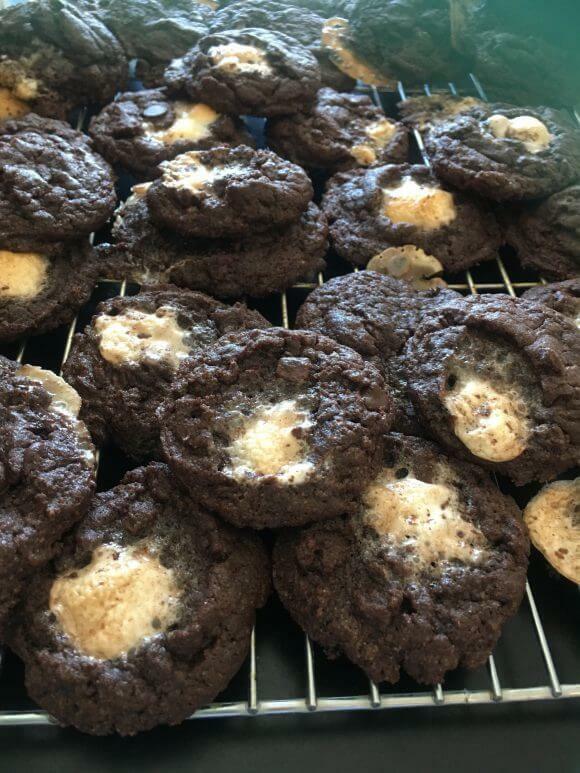 Editors Note: I remade the cookies two years later (weirdly enough, the day after a girl scout event at Oleta) and this time the chocolate cake mix I had on hand had chocolate chips already in it. So instead of adding extra chocolate chips, I added marshmallows, because thats what I had on hand this time. Hence the marshmallows in the better, updated pics I am using.